A variety of unsweetened bread products that are thin, dry and hard-textured, which are commonly served as appetizers or as an accompaniment to a main dish. The name "cracker" is believed to be derived from the sound that is made when this food is broken apart. Crackers can be leavened, such as soda crackers that are made with flour, water, and seasonings and then leavened with bicarbonate of soda. Or, they may be unleavened and made with flour, water and seasonings only. Many crackers have holes spread throughout their surface, which is aaccomplished in manufacturing to enable the cracker to be evenly baked so that the texture can be flat, thin and uniform as well as crispy. 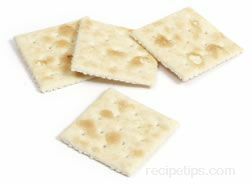 The term "cracker" is often applied to both small food items and larger thin sheets of bread known as cracker bread. In Europe, a cracker will generally be referred to as a biscuit. Crackers have become a snacking item, an appetizer served with a topping such as meat, cheese or spreadable butters, or as an enjoyable addition to lightly enhance a soup, stew, or a main dish.